Una versión ultraligera del tanque medio T20 con el chasis alargado del M7. El vehículo se desarrolló en la primera mitad de 1943. Al contrario que el T20, el T21 contaba con un blindaje reducido y armamento aligerado. El vehículo nunca comenzó a producirse en serie ni entró en servicio. The T21 is a lighter variant of the T20 medium tank. As such, it is rather large for a light tank, but it has good maneuverability and a great view range, on top of having a good power to weight ratio. Unfortunately, it's hampered by its low top speed. Additionally, it uses the same gun as the M4 E8/E2, having rather low penetration in exchange for a high rate of fire and DPM. The tank should be played in a similar manner to the M24 Chaffee. The only thing it lacks, is the Chaffee's amazing 76mm gun with 137 penetration, although the T21 has the same caliber gun with slightly less penetration, but the same damage output. Additionally, the Chaffee is a shorter tank, and a harder target to hit (although it has a very large and weak turret). To players used to the Chaffee this tank might turn out to be a surprisingly good vehicle. As another plus, the T21 has lower repair costs and more profitability than the Chaffee. - Scout: Camouflage Net, Binoculars, (choice is yours, recommend Coated Optics) In this role, you'll play more passive than active scouting. The T21 doesn't have the speed or low profile to play an active scout, so guerrilla tactics are important here; hence the Net and Binoculars. - Flanker: Gun Rammer, Vertical Stabilizer (if you can afford it/steal it off another tank), [Gun laying drive/Vents depending on preference]. This will let you use that sweet M1A2 at will. Play always in and with support and you can lay some serious damage on the enemy. However, do be aware you won't last nearly as long as mediums do while trying to function in the same role as them. Coated Optics might help you if you choose this set up, as it allows you to become a deadly Artillery Hunter, finding and eliminating any SPGs. The QF 6-pdr Mk. III Gun and SCR 528 Radio carry over from the M7. Mount them immediately. Research the 76 mm Gun M1A1. Neither the 76 mm Gun M1A2 nor the Ford GAN Engine require the upgraded suspension, so research them in whichever order you want to. Finally, research the VVSS T48M1A2 Suspension. 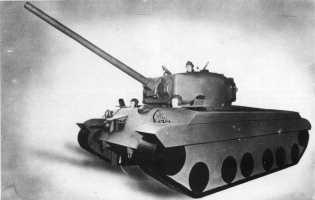 Not strictly part of the T20 series medium tanks, but closely related to them, the T21 was proposed as a replacement for the M3 and M5 series of Light tanks. It was to have been based on the T20 mechanics, would have had a 30 mm armour base, been armed with the 76 mm gun and weighed 24 tons. The design was prepared but held in abeyance as it was deemed too heavy for the light tank class. Ultimately the T21 concept was superseded by the T24 program, which was standardized as the M24 Chaffee. These two volumes are widely regarded as the definitive reference works on the American Light Tanks. Volume-1 covers the real life counterparts of the in-game light tanks: T1, T2/M2, M3, and M5 series and the T21.